The ranches to the west of Torrey started the canal in the 1890's. Later, in 1910, The Torrey Canal finally reached Torrey from its exit out of the Fremont River nearly 11 miles west of Torrey. This major feat provided more water and gave birth to more ranches. 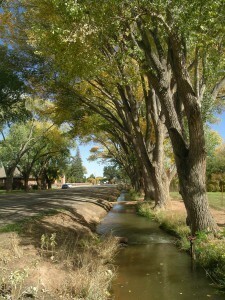 The Torrey Canal also provides water for the huge hundred year old cottonwood trees that line the Main Street. On 18 September 1898, the meeting house for the Torrey saints was started. This one room log structure was constructed on the Torrey LDS lot, with the local settlers furnishing labor, cash, or materials. To celebrate the event when the doors and windows were installed, the people of Torrey and surrounding ranches spent the night dancing to violin and accordion music. On 19 December 1898, a school was also opened in this building. 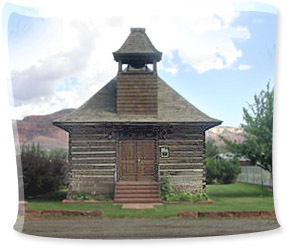 Even after replacement by the sandstone church meeting house, the log building was still used for meetings of the Relief Society, the LDS women's organization, for voting, and for meetings of the local Daughters of Utah Pioneers. It was still being used for these purposes during the 1970's. During the early 1980's the LDS Stake President contacted the Torrey Daughters of the Utah Pioneers (DUP) organization, Camp Radiare, to see if they were interested in obtaining the building for their purposes of preservation of early pioneer heritage and possible use for their meetings. The stipulation was given that the building would be given to the DUP if they moved it off the church property. On 2 February 1991, the task of moving the old log building was undertaken. Local farmers, loggers, and contractors donated the labor and equipment necessary to complete this monumental task. During the summer of 1994, the building was moved for the second time to its final resting place. With a grant from the Utah State Historical Society, the building was lifted up by a crane and gently placed on a cement foundation. Jessie Pace as President of the Torrey Daughters of the Utah Pioneers, Camp Radiare, throughout the time of relocating and renovating the Torrey Log Church/School House was the driving force behind the project. She spent many long hours planning and directing the renovation and even did all the landscaping herself. Her son, James, contributed to the landscaping for his Eagle Scout project. The Torrey Log Church/School House is a unique structure. While log construction was not uncommon throughout pioneer Utah, few unaltered examples remain, perhaps none that were specifically built for the multiple religious/civic, educational function as was this building. The continued use of this early, initial phase type meeting house is also uncommon. It remains a significant building, both locally and throughout Utah.